Home » Guides » Do I Need A Visa For Thailand? At the time of this writing, there are about 48 countries that are eligible for a Tourist Visa Exemption. The Tourist Visa Exemption basically means you can enter Thailand without a visa and receive a visa waiver stamp when you arrive. If you are eligible for the Tourist Visa Exemption, and you arrive at an airport, you will be given entrance to Thailand for 30 days. If you arrive in Thailand via a land border crossing, you will most likely be given entrance to Thailand for 15 days (for the list of exemption view the list below). Travelers who qualify for the Tourist Visa Exemption can also apply for an extension which will allow for an additional 7 days stay if approved. You can check to see if your country is on the Tourist Visa Exemption list using one of the links below. Here is the list of countries eligible for the tourist visa exemption on the Immigration Bureau website. Here are the details for the tourist visa exemption on the Ministry of Foreign Affairs website. At the time of this writing, there are about 28 countries that are eligible for a Visa On Arrival. The Visa On Arrival is different from the Tourist Visa Exemption because with the Visa On Arrival system, you will actually have to fill out a form and pay a fee to receive a visa to enter Thailand. There will be signs in the airport to direct you on where to go to complete the forms. Keep in mind that Visa On Arrival is only available at certain immigration checkpoints (typically airports). You can see the list of immigration checkpoint that allow Visa On Arrival on the Ministry of Foreign Affairs website (link provided below). One common mistake that tourists make is that they fly into Thailand and then take a land tour that exits the country. If they try to re-enter Thailand through a land border crossing that does not allow Visa On Arrival, they may be denied entry to return to Thailand. To check to see if your country is on the Visa On Arrival list, use one of the links below. Here is the list of countries eligible for the Visa On Arrival on the Immigration Bureau website. Here are the details for the Visa On Arrival on the Ministry of Foreign Affairs website. If you check the links provided above and you are not eligible for either a Tourist Visa Exemption or Visa On Arrival (or if you want to stay longer than 30 days) then you will have to apply for a Tourist Visa. 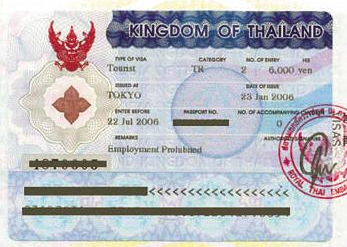 You can apply for a Tourist Visa at your local Thai Embassy or Consulate. Tourist Visas are usually granted for a maximum of 60 days. More information on the list of requirements for a Tourist Visa can be found on the Ministry of Foreign Affairs website (link provided below). Here is the list of requirements for a Tourist Visa on the Ministry of Foreign Affairs website.